Sound "Lithe, agile balance that in many ways belied their size," but the treble was "perhaps a little on the over-active side of things"; "display a fully creditable soundstage, and it was in this respect that I felt the GR 10s were perhaps at their finest." Features Proprietary C-CAM ceramic-coated woofer and gold-dome tweeter; Puresound crossover aims "at keeping large value capacitors out of the critical midrange." Use Worked well in David's 9' x 12' room; "require a healthy dollop of power to sing their siren song"; removal of the tweeter's protective screen required to achieve the best sound. Value "Not the biggest or best speaker money can buy, but they may excel in situations where other speakers won't." As audiophiles, we often overlook small speakers, being drawn like moths to the flame of bigger, meaner, more visually arresting -- if nothing else -- speakers that promise to bring us that much closer to the gospel of sonic bliss. As I (and Im sure many others) can tell you, it doesnt always work that way. Smaller speakers often have many advantages over their bigger brethren, particularly when used in the somewhat smaller living spaces that make up so many of our lives. A high-quality stand-mounted two-way monitor can be a blessing. Enter the GR 10 ($1495 USD per pair), the smallest member of the Gold Reference series from Monitor Audio, a British company that has had success with their highly acclaimed Silver and Bronze series, and has been making high-quality speakers for more years than I can recall. Will the GR 10 up the ante to the next level, as implied by its moniker? Lets get busy and find out. Speaker tech or tech speak? Appearances can often be deceiving, and in the case of the GR 10, this is somewhat true. The GR 10 appears somewhat pedestrian, until the grille comes off, that is. Behind lurks some serious driver technology. 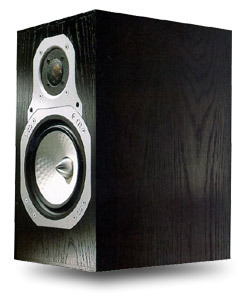 The complement for this rear-ported two-way speaker was designed and built in house by Monitor Audio, which enabled the company to "tune" the design to best match the needs of the specific drivers to the enclosure, or vice versa if need be. The 6 1/2" bass/midrange driver is rather unique in appearance, showing a dimpled, white-colored surface. The appearance is due to the use of material known as C-CAM (ceramic-coated aluminum/magnesium). This material has its heritage in the aerospace industry, having been used in the manufacture of blades for jet engines. It exhibits a very high stiffness-to-mass ratio, making it ideal for use in the manufacture of loudspeaker cones. The ceramic coating is added later in the manufacturing process to enhance the rigidity of the driver's surface. The dimpled RST (Rigid Surface Technology) pattern is designed to effectively displace standing wave patterns across the surface of the cone. The 1" gold-dome tweeter is also a proprietary drive unit. It's made from a variant of the C-CAM material, and the alloy is also treated with the ceramic coating process, which helps push the first break-up node to beyond 30kHz. The new crossover for the Gold Reference series is dubbed Puresound and is aimed at keeping large value capacitors out of the critical midrange, which reportedly can result in a smearing or blurring of the sound. The GR 10 measures 14"H x 8"W x 10"D and weighs in at 20 pounds. It's kind of nice not to need a back belt or the help of a friend to tinker with placement and toe-in. The speakers are biwirable as well as magnetically shielded. Good stands are mandatory, and as such the distributor was kind enough to provide some serious mass-loaded Monitor Audio stands to provide a proper anchor for the GR 10s. Oh well, so much for not needing a back brace. The review samples came in black-oak finish; cherry and rose mahogany are also available at no extra charge. For this review, I had a healthy gang of team players to help dig for the gold. In the main system, along with my trusty Sonic Frontiers SFT-1 and Mark Levinson No.360 D/A converter connected by a Transparent Reference AES/EBU digital cable, I also had on hand a Musical Fidelity A3CD one-box CD player. The main interconnect here was either Transparent Ultra or Musical Fidelity NuVista. The preamp was a Blue Circle BC3000 or my Aragon Aurum, connected to the amps by Transparent Balanced Music Link Plus. Power amplifiers were the Blue Circle BC8 monoblocks or a Musical Fidelity A300 integrated amp (review forthcoming). Speakers were the B&W Nautilus 804s cabled by either Transparent MusicWave Super XL biwire or Musical Fidelity NuVista speaker cable (single wire). Power was filtered by an Audio Prism Foundation II with a variety of QuietLine filters on various outlets. Power cords were from a variety of GutWire, Blue Circle, and Transparent products that I had around at the time of review. Monitor Audio's North American distributor suggested that I remove the mesh screen that protects the GR 10's tweeter. This should ONLY be done if you dont have small prying fingers around that could potentially damage the very fragile gold-dome tweeter. The result of this small but worthwhile modification was significant to the clarity and purity of the high frequencies. Most of my serious listening was done in this way, along with the grilles removed. Walk small and carry a big stick! The GR 10sare possessed with a lithe, agile balance that in many ways belied their size. This is one small speaker that doesnt sound the least bit small or closed in. But make no mistake, these little chunks of gold require a healthy dollop of power to sing their siren song. In this respect, I achieved great results with the excellent Musical Fidelity A300 integrated (150Wpc). Mating the GR 10s with the Musical Fidelity A300 produced a fine combination that proved to be easy to listen to for extended sessions. I found this particular combination succeeded in my smaller room (9' x 12'), where I had the GR 10s' stands situated close to the front wall, thereby enhancing the bass response, yet still not detracting from the fine image that the speakers can conjure. This will be good news indeed for those who need to place their speakers closer to the front wall than is perhaps desirable due to room restrictions. But set up in my main system and being joyously juiced by the big Blue Circle BC8 monoblocks, the GR 10s truly opened up and performed. Listening to Patricia Barber's "Inchworm" from Café Blue [Blue Note/Premonition 7243 5 21810 2 5] revealed top-notch spatial performance along with tight, articulate bongos and percussive instruments. I also noted fine control of the sibilance of Barber's voice on this track. I was also captivated by the GR 10s' ability to display a fully creditable soundstage, and it was in this respect that I felt the GR 10s were perhaps at their finest. Their ability to float Ella Fitzgerald along with Joe Pass on guitar on "Take Love Easy" from the JVC XRCD of the same name [JVCXR-0031-2] was particularly fine, with Pass' guitar being well articulated. Ellas voice was clean and showed no sense of overhang, or chestiness -- just good clean Ella! Listening to "Aint Misbehavin" from the NAIM Sampler2 [Naim 002], I was struck by the almost uncanny vocal quality, almost scaring me into believing the vocalist was right in the room, again on this track the acoustic guitar was clean, focused and airy. Supreme clarity you could call it. Bass was well delineated and agile, with respectable fullness for what is essentially a small speaker. No, your walls won't flex, but they wouldn't with any speaker the size of the GR 10s. Interestingly enough this was one of the few speakers I have come across with which biwiring made very little difference to the overall performance. I did note that when biwired, the GR 10s showed a slight gain in upper-midrange clarity. However, in all honesty, I noted a bigger gain from removing that mesh screen on the tweeter. Inviting a comparison between the Monitor Audio GR 10 and my resident speaker, the B&W Nautilus 804, would have most people raising eyebrows -- in an ideal world, the logical comparison would be to the Nautilus 805. But there are reasons some listeners gravitate to stand-mounted speakers, and I was interested to discern what they were. In actual fact, this ended up being an interesting comparison. Both the Nautilus 804 and GR 10 are rather neutral, the GR 10 displaying a fast, uncolored midrange that was capable of matching the Nautilus 804 in terms of detail retrieval, particularly on low-level information embedded within mixes. Both speakers displayed an open airiness along with the ability to generate a credible soundfield. However, I did find that the N804 seemed more three-dimensional, giving body and shape to images within the soundstage. The bass end of things was where the comparison became clearly slanted in favor of the Nautilus 804, and so it should be. The dual woofers and larger cabinet volume gave the nod to B&W in terms of a richer, deeper musical foundation. Putting the bass into perspective, the GR 10 certainly wasnt horribly embarrassed. It was able to aptly communicate a fair quantity of information down below, and particularly in my smaller room, it worked really well to supply good levels of bass without overloading the room. The treble of both speakers was clean and articulate. I occasionally felt that the GR 10 was perhaps a little on the over-active side of things, sounding somewhat etched and not as well integrated as the highs of the Nautilus 804. However, the respective price differential between these two speakers means that the N804 should have the edge, and the GR 10s abilities in the upper ranges suggest that the tweeter is indeed able to meet the gold standard set for it by the designation of the speaker. The Monitor Audio GR 10s are speakers that can be easily overlooked in the market, particularly with their grilles in place, as they simply blend in with a plethora of other small two-way speakers. However, take their grilles off, and if you can, get that mesh grille off the tweeter, sit back and consider what these speakers dont do. They dont annoy. They dont take up gaggles of real estate. They dont need biwiring, or shotgun cabling to make them sing. They dont need a huge room in which to work their magic -- as a matter of fact, some of the best time I spent with them was while they were playing in my smaller room. The GR 10s are not the biggest or best speaker money can buy, but they may excel in situations where other speakers won't. Price: $1495 USD per pair.